24-Jul-2000 -- I stumbled upon a reference to this site while reading Jessamyn.com and thought it was a neat idea. Several months later I ended up purchasing a Garmin Emap. 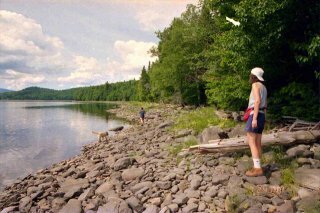 Checking this site I saw that there was an open Confluence within 20 miles of our summer vacation spot in Rangeley Maine. I checked the confluence location with Street Atlas 7 and found that there were logging roads to within a quarter to a half mile of the lakeshore and decided it was an absolutely do-able trek. The actual confluence is under water; 'Lucky' our yellow lab got the closest to the actual spot. The kids still refer to the outing with pronounced rolling of the eyes as "Dad's GPS hike." #1: Azicohos Shorline with Brian and Dog "Lucky"